Small desks like the Amish Berlin Economy Desk with Side Door mean a lot. This compact office furniture is ready to fit in right where you need to create an office space. For a quiet bedroom corner, hallway, office or family room, the Berlin has all the essentials. This wood desk is a great candidate for a student bedroom or dorm room. The Berlin Economy Desk measures 36" wide and 20" deep. It features a side cabinet door with one adjustable shelf and a central drawer complete with a laptop pullout for convenience. Cut outs in the pullout drawer keep equipment wires neat and tidy. 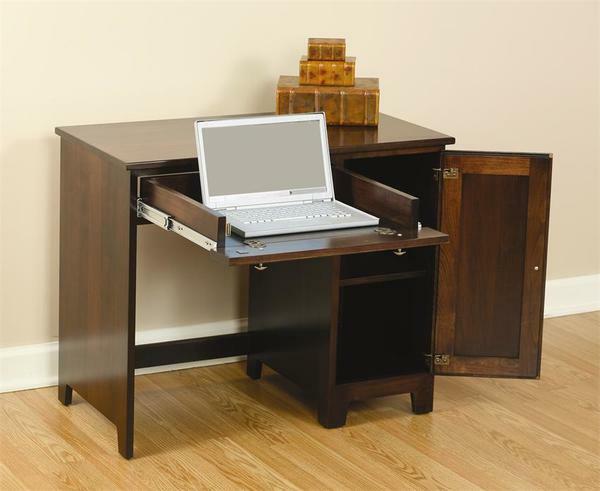 This little desk is handcrafted by skilled Amish craftsmen at their wood shop near Berlin, Ohio. Amish craftsmanship focuses on function and durability, creating furniture that can be enjoyed for generations. Please email or call us with any questions about the Berlin Economy Desk at our toll-free number 866-272-6773. We thank you for shopping with DutchCrafters.